IBM® delivers kernel fixes in the form of ifixes to resolve issues that are reported by customers. If a fix changes the IBM AIX® kernel or loaded kernel extensions that cannot be unloaded, the host logical partition (LPAR) must be rebooted. Starting with AIX version 7.2, AIX provides a feature called AIX Live Update where the AIX OS provides a new function that eliminates the downtime associated with patching the AIX operating system. This new feature allows workloads to remain active during an AIX Live Update operation and the operating system can use the interim fix immediately without needing to restart the entire system. Figure 1 represents how AIX Live Update works. This article discusses the high-level concepts relating to AIX Live Update with IBM DB2® application running on an AIX system, and then provides a real example of how and what to do before performing AIX Live Update on an AIX system while the DB2 application is running on the system without causing any impact on the workload. When customers have the DB2 application running on their system and want to perform AIX Live Update on it, we need to make sure that the DB2TCP_CLIENT_KEEPALIVE_TIMEOUT value is set properly to support AIX Live Update with DB2 workload running before AIX Live Update. We can set this value by checking the blackout time from the preview mode of AIX Live Update. After setting this value, we can follow the steps to perform AIX Live Update. Post AIX Live Update, we can see this DB2 workload or process running perfectly fine on an AIX system without any issues. When we have the DB2 workload running as an application and a customer needs to perform AIX Live Update on that system, the customer needs to perform changes in the DB2 database configuration before performing AIX Live Update. This article outlines the requirements for configuring an AIX partition with DB2 to support AIX Live Update. AIX 7.2 TL0 and later. AIX Live Update supports all virtual Fiber Channel and virtual SCSI devices, provided, a supported path-control module (PCM) is used. For example, the IBM default multipath I/O (MPIO), Subsystem Device Drive Path Control Module (SDDPCM), and EMC Power Path are supported, but Hitachi Dynamic Link Manager (HDLM) is not yet supported. Also, SAS devices are not supported. A minimum of four disks (in addition to rootvg) are required. Each additional disk should be equal to (or greater than) the size of the rootvg disk. Each disk used for AIX Live Update should be configured with a multipath setup and it has been already tested with IBM System Storage® DS8000® and IBM XIV® Storage System. Note: Starting with version 7.2 TL1, the two temporary disks (todisk and tsdisk) are not required unless they have paging spaces outside the rootvg. Install DB2 and start workload on system as required. Note: The value depends on the blackout time. However, AIX Live Update doesn’t have the way to determine blackout beforehand. A rule of thumb is to run AIX Live Update in preview mode to get the estimated blackout time and adjust the value of DB2TCP_CLIENT_KEEPALIVE_TIMEOUT accordingly. Configure an AIX LPAR as a DB2 server. Perform AIX Live Update when DB2 workload is running on the LPAR. After completing AIX Live Update, validate the LPAR configuration to check DB2 configuration and status of workload. Ensure system has met the processor and memory requirements as mentioned earlier. Ensure we have minimum 300 GB disks available in system. Prefer multiple disks of different sizes rather than getting a single 300 GB disk. Ensure DB2 is configured with BLU acceleration workload and check db2start is already running on system. 3004-692 Error changing "id" to "300" : Account exists. Install DB2 using the db2install command which is invoked from the path where the DB2 image is present. The DB2 binaries will be present in /opt/IBM/db2/. uses "64" bits and DB2 code release "SQL10058" with level identifier "0609010E". Informational tokens are "DB2 v10.5.0.8", "s160901", "IP23998", and Fix Pack "8". Product is installed at "/opt/IBM/db2/V10.5". 02/06/2018 03:02:19 0 0 SQL1026N The database manager is already active. SQL1026N The database manager is already active. DB20000I The UPDATE DATABASE CONFIGURATION command completed successfully. 02/06/2018 04:13:27 0 0 SQL1026N The database manager is already active. $ As per above output, we don’t have the DB2TCP_CLIENT_KEEPALIVE_TIMEOUT value set. So, we need to set an appropriate value for this attribute to support AIX Live Update with the DB2 workload running. We can set this value by checking the blackout time from preview mode of AIX Live Update. Validating AIX Live Updateinput data. PASSED: device size is sufficient. PASSED: adapters can be divided into two sets so that each has paths to all disks. PASSED: sufficient space available in /var. PASSED: sufficient space available in /. PASSED: rootvg is not part of a snapshot. PASSED: pkcs11 is not installed. PASSED: The trustchk Trusted Execution Policy is not on. PASSED: The trustchk TSD_FILES_LOCK policy is not on. PASSED: the boot disk is set to the current rootvg. PASSED: the mirrorvg name is available. PASSED: the rootvg is uniformly mirrored. PASSED: the rootvg does not have stale logical volumes. PASSED: all of the mounted file systems are of a supported type. PASSED: this AIX instance is not diskless. PASSED: no Kerberos configured for NFS mounts. PASSED: Trusted Computing Base not defined. PASSED: no local tape devices found. PASSED: live update not executed from console. PASSED: the execution environment is valid. PASSED: enough available space for /var to dump Component Trace buffers. PASSED: enough available space for /var to dump Light weight memory Trace buffers. PASSED: all devices are virtual devices. PASSED: No active workload partition found. PASSED: HMC token is present. PASSED: HMC token is valid. PASSED: Provided LPAR ID is available. PASSED: A virtual slot is available. PASSED: RSCT daemons are active. PASSED: lpar is not remote restart capable. PASSED: no virtual log device configured. PASSED: lpar is not using shared memory or ams resources are available. PASSED: the disk configuration is supported. PASSED: no Generic Routing Encapsulation (GRE) tunnel configured. PASSED: Firmware level is supported. Validating live update input data. PASSED: The trustchk Trusted Library Policy is not on. PASSED: the rootvg does not have the maximum number of mirror copies. PASSED: multibos environment not present. live update operation begins in 10 seconds. Live AIX update in progress. Initializing live update on original LPAR. Beginning live update operation on original LPAR. Requesting resources required for live update. Notifying applications of impending live update. Creating rootvg for boot of surrogate. Creating mirror of original LPAR's rootvg. Moving workload to surrogate LPAR. 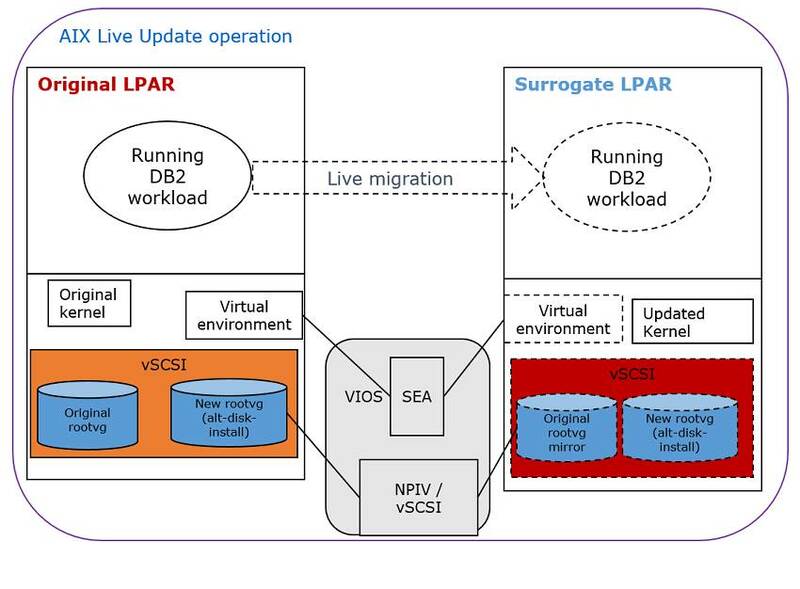 Workload is running on surrogate LPAR. Shutting down the Original LPAR. The live update operation succeeded. With successful AIX Live Update, we can see that the db2 instance is already running, and the database connection is still alive. We can also verify that the DB2 workload is running fine on the system when we look from logs. This article helps users to understand the requirements for configuring an AIX partition with DB2 to support AIX Live Update.